More and more people are asking me for vegetable recipes. For myself, I am forever on the quest to find new and interesting combinations. With the holidays coming and all the rich food that is starting to show up at parties, I thought a new and unusual vegetable dish could do everybody a little good. 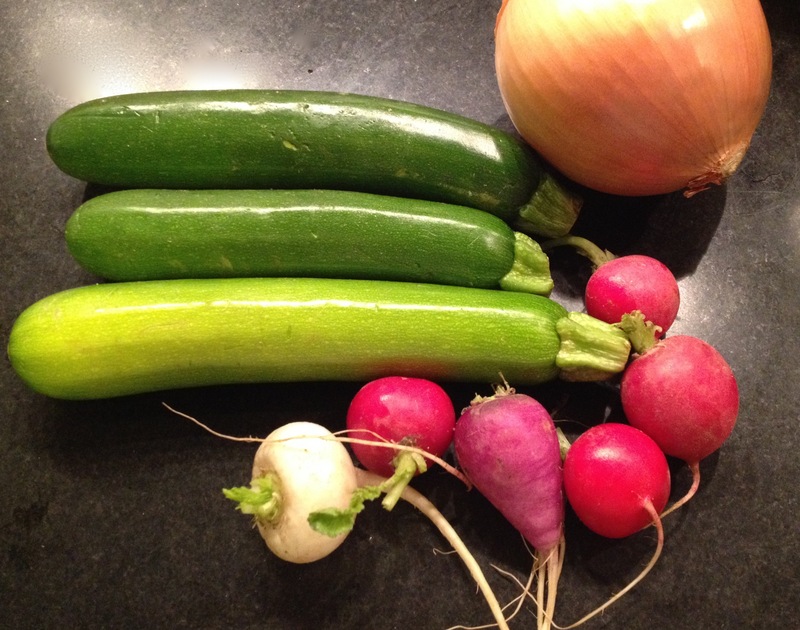 I had this beautiful bunch of multicolored radishes, some zucchini and a sweet Spanish onion. So I put together this dish, Sauteed Zucchini with Onions and Radishes, topped with Feta and Oil-cured Moroccan Olives. Radishes are usually eaten cold and crisp, by themselves, with a touch of salt or used as dipping instrument. But ever since Mark Bittman published an article several years ago on grilling radishes in the summer, I have been eating them grilled or sautéed. I love them cooked! Now when you grill them, the smokey taste addition is wonderful, but they lose their color and do not look so pretty. They sort of look like anemic radishes. But, when you sauté them, they somehow hold their color better. Or at least these radishes did. These multi-colored radishes in my fridge needed to be used, along with the zucchini. My mother used to make a dish of sautéed onions and zucchini topped with grated parmesan and sharp cheddar cheese. My husband still asks for that dish every so often, so I know the combo of onions, zucchini and cheese is good. But I had some feta that needed to be used and then these oil-cured Moroccan olives were hanging around too and the dish needed a punctuation of color. So there you have it. That’s how I created this dish – really using my skillet as a palette as I do when I paint. I think you will LOVE this! Warm the oil in a large skillet on medium heat, add the butter to melt. Add the sliced onions, cover and stir often, cooking for 10 – 15 minutes. Add the zucchini and radishes and toss until crisp tender. Lower heat to low. Season very lightly with salt and pepper. (remember the feta and olives are salty) Sprinkle the feta cheese and olives on top. Cover for 3 – 5 minutes to warm the cheese and olives. Serve right away using a large pancake turner to pick up a section and keep it pretty. Enjoy!